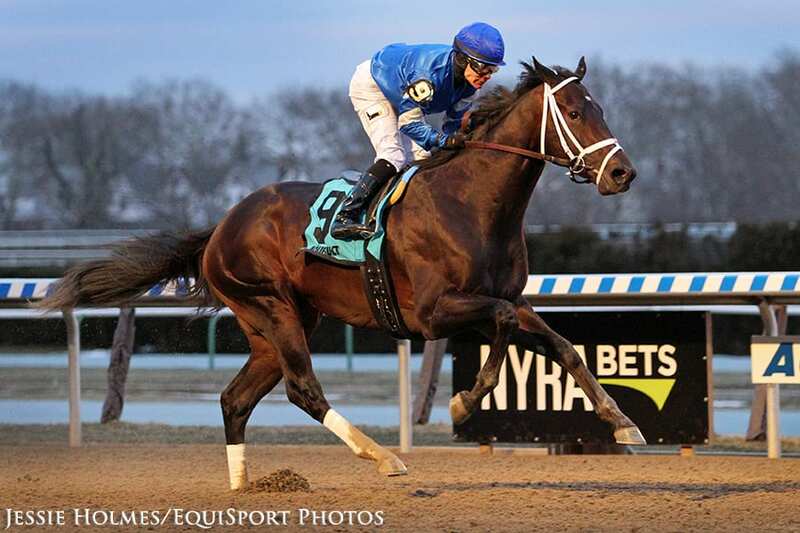 Enticed, a Godolphin homebred by Medaglia d'Oro who ran a dull fourth as the favorite in the Grade 2 Holy Bull at Gulfstream Park last month, found Aqueduct more to his liking on Saturday, winning the G3 Gotham by 2 3/4 lengths over longshot Old Time Revival. Ridden by Junior Alvarado, the Kiaran McLaughlin trainee covered the one-turn mile in 1:38.24 after fractions of :23.14, :46.43 and 1:11.77. Old Time Revival finished second, with 8-5 favorite Free Drop Billy another four lengths back in third and 5-2 second choice Firenze Fire fourth. Enticed paid $8.80 as the third choice. The Gotham victory awarded Enticed 50 points as part of the 50-20-10-5 Derby point system, more than enough to get into the Kentucky Derby field of 20. Enticed broke well from the outside post position and was wide throughout as Code Blue and Old Time Revival battled on the front end early. Code Blue retreated on the turn and Old Time Revival opened up, but Enticed was bearing down on him as the field turned for home. He took command in the final sixteenth, then was eased up by Alvarado in the final yards, winning in hand. “He broke good,” said Alvarado. “I wanted to make sure to be a little close, but I felt the first part of the race we were going a little fast for the way the track was playing today. I wanted to make sure I kept him clear on the outside, I didn't want to get him in trouble at all because he's a horse that takes a while to get going. Out of the multiple Grade 1-winning Mineshaft mare It's Tricky, Enticed was winning for the third time in five starts. After breaking his maiden Sept. 4 at Saratoga on a muddy track, Enticed finished third behind Firenze Fire in the G1 Champagne. Shipped to Kentucky for his next start in the G2 Kentucky Jockey Club at Churchill Downs, Enticed held on to win by a head over Tiz Mischief. His worst performance came next out in the Holy Bull. “It worked out great,” McLaughlin said. “Junior [Alvarado] rode a great race. The 'clean-faced' plan worked out well. It was a great run and everything went perfect. “That's the Enticed we thought we had last year, ending up on such a high note with the Jockey Club at Churchill last year. Dale Romans, trainer of Free Drop Billy, said, “We got 10 points today. If he belongs, we'll have enough points to get there [currently with 24 qualifying points to the Kentucky Derby]. Right now, that should be enough. He still has to come back and run well next time. I think he ran a clean trip. There was some good things to see, but I wanted him to win. I thought he would win. This entry was posted in NL Article, Triple Crown and tagged aqueduct, Dale Romans, enticed, free drop billy, Godolphin, gotham, gotham Stakes, jimmy bell, Junior Alvarado, kiaran mclaughlin, medaglia d'oro, road to the kentucky derby, wood memorial by Paulick Report Staff. Bookmark the permalink.